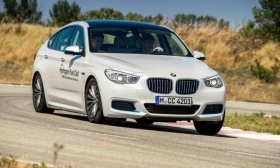 BMW is demonstrating fuel cell technology in a 5-series Gran Turismo prototype. MIRAMAS, France (Bloomberg) -- BMW will test a vehicle powered by hydrogen fuel cells -- developed with Toyota -- for the first time on public roads this month as the German automaker looks to expand clean-car offerings after rolling out the battery-powered i3 in 2013. BMW is developing fuel cells with Japanese partner Toyota Motor Corp., and it demonstrated a 5-series Gran Turismo prototype in Miramas on Wednesday that uses the companies’ joint technology. The model is part of the industry’s multibillion-dollar effort to create alternative powering setups and improve fuel use to meet tightening emissions rules. Fuel cells, which have provided spacecraft with power since the 1960s, produce electricity by reacting hydrogen with air, enabling longer travel than battery-driven vehicles while emitting only water vapor rather than carbon dioxide. Disadvantages include a lack of service stations equipped to replenish the hydrogen gas, and the high cost of rare metals needed for the technology. BMW is in talks with other carmakers, governments and utilities on how to speed up the creation of a refueling network, Axel Ruecker, who’s part of Munich-based BMW hydrogen development team, said at the prototype demonstration. Toyota and Japanese competitors Nissan Motor Co. and Honda Motor Co. pledged Wednesday to contribute funds to developing a hydrogen-fueling network in that country. On a trip around the Miramas track, the Gran Turismo handled like any other electric car, except for a hissing sound during sharp acceleration from a pump passing hydrogen and air through the fuel cells. BMW also showed a plug-in hybrid version of its van-like 2-series Active Tourer, due to go on sale next year, and a 1-series compact equipped with a conventional motor that uses water injection to boost fuel efficiency. The fuel-cell Gran Turismo has a range of 500 kilometers (310 miles) before refueling. That’s more than triple the i3’s 160 kilometers. The i3’s batteries take at least five hours to recharge, compared with five minutes to fill the prototype’s hydrogen tank. By the start of 2018, the world’s fleet of fuel-cell cars will number just 8,400, up from a total 1,275 at the end of this year, Bloomberg New Energy Finance estimates. 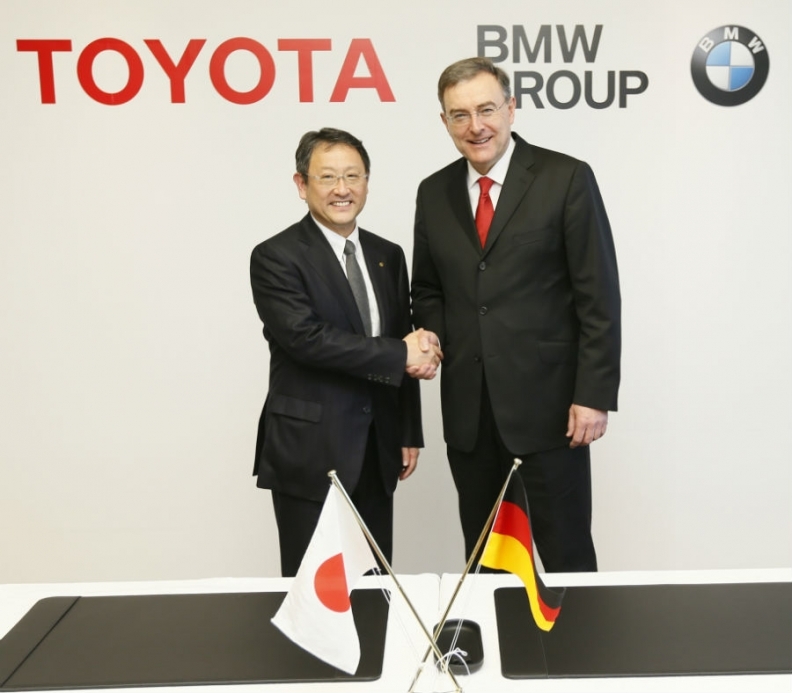 Toyota President Akio Toyoda, left, and BMW CEO Norbert Reithofer began their collaboration in January 2013. BMW, the world’s largest maker of luxury cars, came late to fuel cell technology after previously focusing on hydrogen combustion engines, including a limited run of 7-series sedans in 2005. That project struggled with developing storage tanks for the liquid hydrogen fuel. Competitor Mercedes-Benz started working on fuel cells for vehicles in 1994 and began producing a version of its B-class compact powered by the technology in 2009. Toyota, the world’s biggest auto manufacturer, began sales in December of the $62,000 Mirai fuel-cell sedan. It’s targeting 3,000 deliveries of the car in the U.S. through 2017. BMW began cooperating with Toyota in 2013, with about 100 people involved in the fuel-cell project across the two companies. The partners said Monday that they plan to make fuel-cell components by 2020. The alliance also includes sharing development of a mid-size sports car.